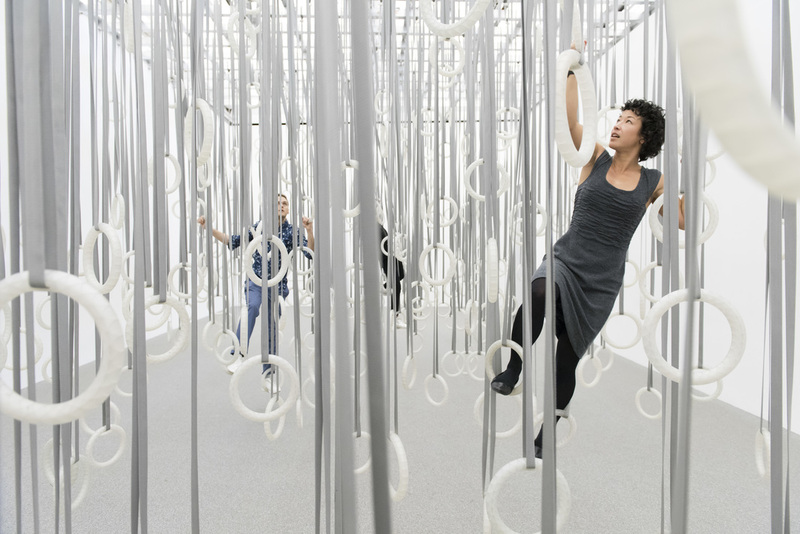 William Forsythe, The Fact of Matter, 2009, polycarbonate rings, polyester belts, steel rigging. A suite of words crowds hungrily around the work of William Forsythe: aleatoric, heuristic, calculated, diagnostic, investigative, algorithmic, reflexive. This stark and scientific vocabulary belies the sly varieties of play on view in this exhibition at the ICA. The centerpiece of the show—the first comprehensive exhibition of Forsythe’s work in the United States since 2009—is The Fact of Matter, 2009, a field of gymnastic rings, which visitors are instructed to climb across without touching the ground. (This reviewer and his significant other garnered not one but two contusions and a mild groin strain in the process of flailing and failing.) Whether tasking the viewer with tugging open an excessively weighted door or crawling into a tomb-size room or traversing a gauntlet of swinging plumb bobs, Forsythe sets the stage for physical failures. After clenching, dodging, bending, and stretching, we are delivered back to our bodies more attuned to the isolated gestures that compose the flow of daily movement. We can hear the chiding skeptics—Too much entertainment in the museum! The death of critical thinking!—but Forsythe seems to stave off the mind-drooling thrills. He challenges the Western veneration of the mind at the expense of the body, typically left quiet and dumb. The force of his “Choreographic Objects” is that they flush choreography out of the body like a flock of birds from a tree and settle it on the still branches of objects—and of thought itself.